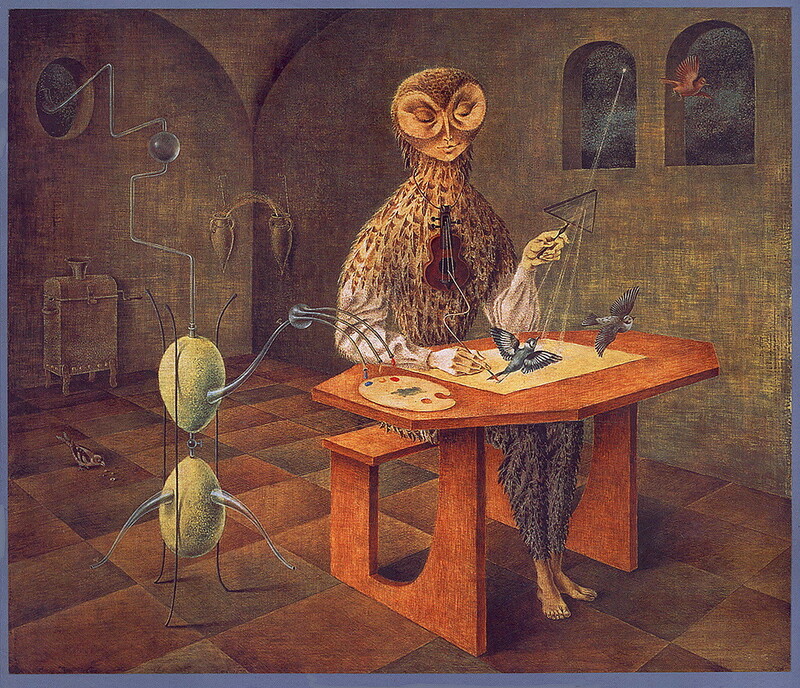 Remedios Varo (1908-1963) was a Spanish painter associated with the French and Mexican Surrealist movements. Varo was classically educated in painting as a child, before leaving the academy to join the growing Surrealist movement in Barcelona. Forced to flee Franco Spain and Nazi Germany, Varo settled in Mexico City in 1940, where she would produce most of her mature works. Varo’s work features surreal landscapes with mystical and symbolic imagery, often blurring the lines between living and inanimate forms and highlighting complex female icons: alchemists, pilgrims, and creators. 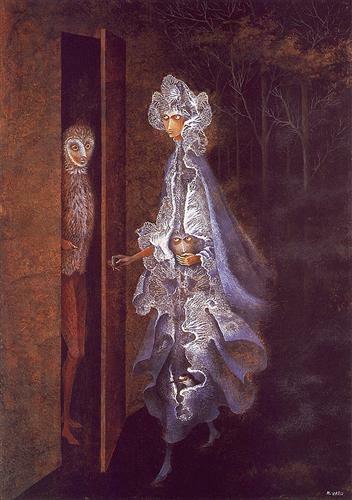 I was drawn to Remedios Varo because of the beauty of her paintings, which are brightly colored and extremely intricate; and because of the bizarre but intuitive symbolism that appears in her artwork. Varo worked mostly in small-scale oil paintings, and the majority of her work was produced during only ten years of her life in Mexico City. Although her subjects are dreamlike, her painting technique is very precise and full of small details. She uses extremely bright colors and exaggerated shading to give an unreal quality to her work; however, her paintings have an internal logic that makes magical or bizarre subjects seem reasonable. The overall effect, as for many surrealists, is paintings that communicate an emotional or spiritual state rather than a concrete reality. Varo often painted scenes where female figures interact with living environments, blurring lines between architectural and organic, living and inanimate forms. Her characters usually resemble her, and engage with themes of displacement, travel and spirituality that were important in her own life. In Disturbing Presence (1959), a woman peels nervelike shapes from a wooden desk as a face emerges from the back of her chair to lick her neck. This bizarre image shows recurring themes of inanimate objects developing life; creative production by female scientist/magicians; and intrusive presences which disrupt or contain the creative energy. While Varo uses a wide range of surreal icons – human-animal figures, active and mutating scenery, moonlight, starlight, music and chemistry – her work all seems to draw on a single symbolic playbook, which is easy to understand emotionally but very unique to her work. Varo renounced Roman Catholicism early in life, but continued to be fascinated by religion and spirituality; she read extensively on occult practices as well as psychoanalysis and modern science, and these influences appear in the symbolism of her work. Many of her paintings have tarot-like occult imagery mixed with alchemy or magical science. In Creation of the Birds (1957), an owl-like scientist creates songbirds out of refracted starlight, violin music, and paints distilled from an alembic. Psychoanalytic theories about the unconscious and collective archetypes are also visible in her art; although many of her recurring icons seem to have personal rather than universal meanings, their emotional content is always clear. Remedios Varo was involved with the Surrealist movement of the early 20th century, and her close friends and partners were central Surrealist figures. However, she avoided the themes I like least about surrealism: randomness/automatic artwork, and the problematic use of female symbols. Many male surrealists used the female body in their work in sexualized, dismembered, or one-dimensional states, representing some aspect of the male psyche instead of an actual female person. Varo instead presents dreamscapes with feminine or androgynous protagonists who actively control their surroundings. Rather than being sexual objects or traditional archetypes of mothers, virgins, etc., Varo’s most common subject is a sort of female goddess/scientist creating and interacting with a living environment. Her characters are often in positions of entrapment, discovery or pilgrimage; these themes are common in feminist literature, but I was surprised to see them represented visually in such an evocative way. Janet A. Kaplan. 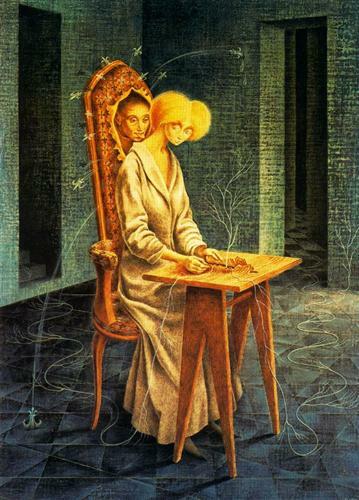 “Remedios Varo.” Feminist Studies. Vol. 13, No. 1. Spring 1987: 38-48. Via JSTOR. Janet A. Kaplan. “Remedios Varo: Voyages and Visions.” Woman’s Art Journal. Vol. 1, No. 2. Fall 1980: 13-18. Via JSTOR. Deborah J. Haynes. “The Art of Remedios Varo: Issues of Gender Ambiguity and Religious Meaning.” Woman’s Art Journal. Vol. 16, No. 1. Spring 1995: 26-32. Via JSTOR. All images retrieved from WikiArt.org. Albrecht Dürer (1471 – 1528) was born in the Imperial City of Nuremberg, in southern Germany. He is conventionally regarded as the one of the greatest known artist of the Northern European Renaissance, as an innovator in woodcuts, printmaking, engraving, painting, and the study of human proportions. 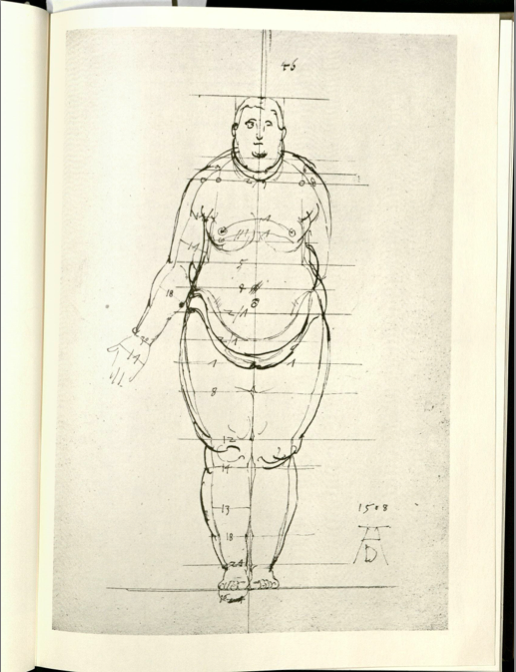 As someone who has always struggled with drawing accurate proportions of the human body, I chose to focus on Dürer’s career as a theorist of human proportion and his book The Human Figure. Dürer was greatly concerned with exploring the theoretical aspects of perspective and human proportions. Among the more than 1500 pages of his manuscripts in Nuremberg, London, Dresden, and Berlin, the predominant part is devoted to studies of the human body. These manuscripts reveal how meticulously Dürer pursued the subject in order to arrive at a workable system of constructing the human figure, suitable for artists. 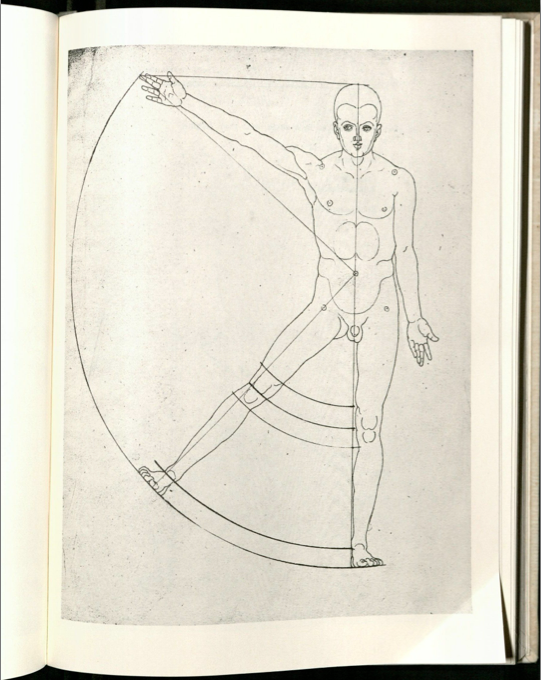 Fig.4 is typical of the drawings appearing in Book II of Dürer’s Four Books on Human Proportion. This figure is constructed by a so-called “exempeda (i.e. six feet) method.” Based on the canon of Vitruvius that the foot is one six of a man’s height. Dürer’s figures were methodically constructed, he wrote, with a compass and a ruler. His drawings are marked by the maturity of mathematical, philosophical, and aesthetic theory. After perusing his works in the book, I was thoroughly impressed by Dürer’s talent, ambition, and wide-ranging intellect in general. Beyond just introducing artistic traditions to his North European contemporaries, his treatises on human anatomy and proportion have fundamentally transformed the way artists depict human proportions, even till today. I especially enjoyed Dürer’s approach because it encompasses both art and science – in particular, mathematics. I have learned that true form, in summary, is simply the primary mathematical figure (straight line, circle, conic sections, curves, surfaces, solids, and so on), constructed geometrically or arithmetically, and made beautiful by the application of some canon of proportion. 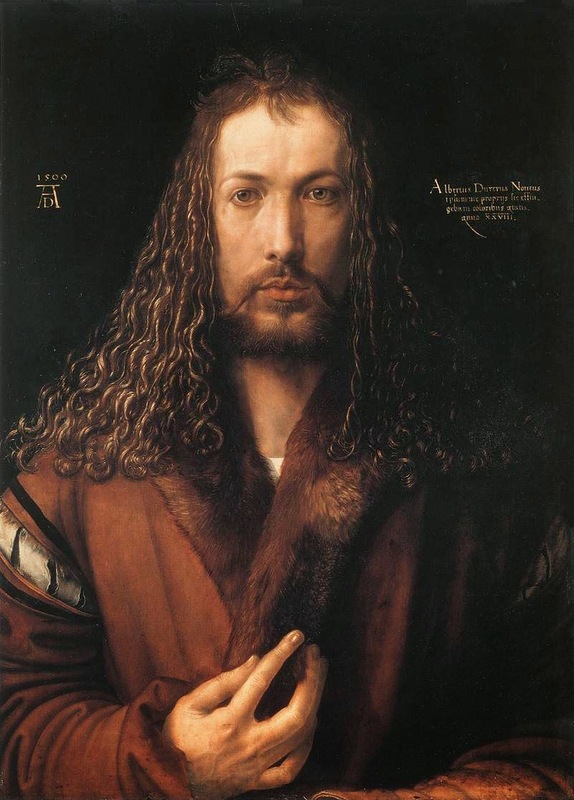 Dürer, A. (1972). 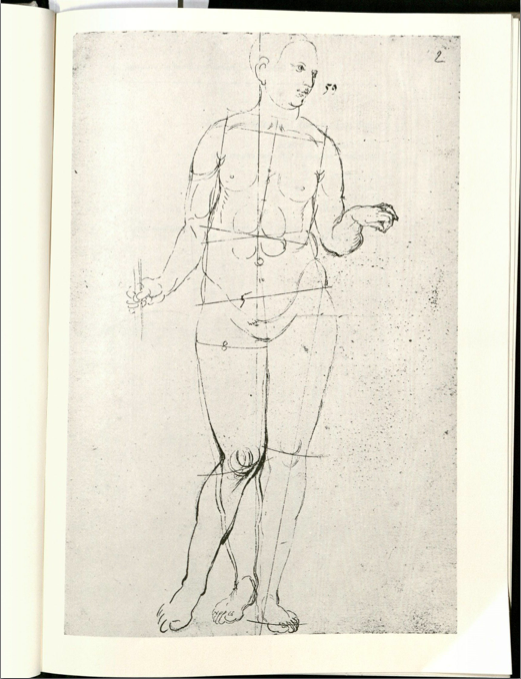 Albrecht Dürer-the human figure: the complete" Dresden sketchbook". W. L. Strauss (Ed.). Dover Publ..
Dutch art history is during the 17th century was know as the “Dutch Golden Age” because of the amount of paintings that were produced during this time and the types of paintings that were made. Dutch artists broke off from the traditional style of Baroque, which is a style of art that is highlighted by elaborate detail to produce drama, tension, and grandeur, to a more realistic style that was concentrated on the real world. These paintings included cityscapes, historical paintings, and still life. When the French Invasion occurred in 1671, the Golden Age came to end and introduced artists such as Vincent van Gogh, who became world renowned for his use of light and color. After the death of Vincent van Gogh, artist Piet Mondrian revolutionized Dutch art. He was well recognized because of his Neo-Plasticism style or De Stijl. Piet explained this style of expression as “plastic” which referred to the action of forms and colors on the surface of the canvas as a new method for representing reality. Piet Mondrian was born in Amersfoort, Netherlands in 1872 to a family of painters and artists where art and music were encouraged. Piet’s father gave him drawing lessons as a kid, while his uncle, who was a well-known painter, taught Piet how to paint. This led him to pursue a career in education and became a drawing teacher, while still actively painting. The environment of the Netherlands where he drew naturalistic landscapes and incorporated his signature abstract design and primary colors influenced the beginning of his career. When he moved to Paris, Piet became influenced by the Cubist style of Picasso and this greatly impacted his future work. The Gray Tree (1912) embodies Mondrian’s early transition towards abstraction of naturalistic scenery and the influence of Cubist design. 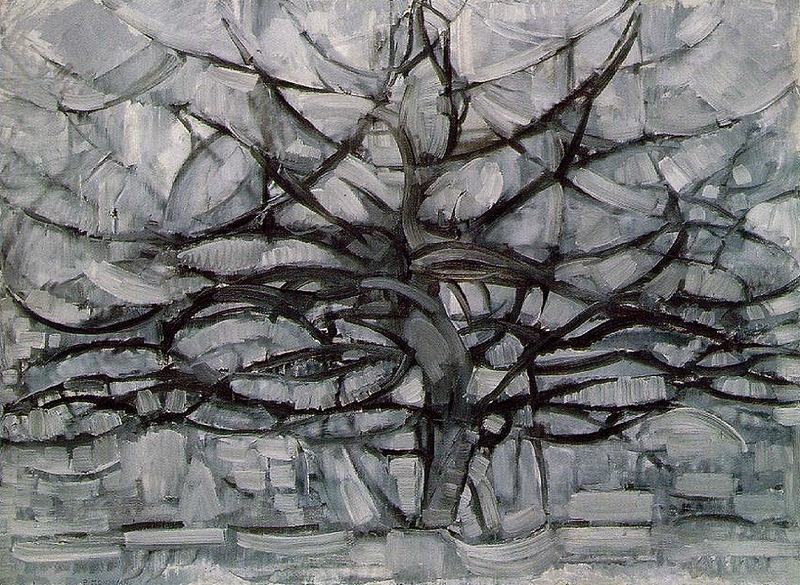 The reason why Mondrian changed the landscape of European art was because many artists of the time period were depicting realistic, naturally occurring paintings, where in this painting the three-dimensional tree has been reduced to lines and planes using only gray and black colors. Mondrian’s later paintings of tress were abstracted to the extreme of being barely detectable through the use of horizontal and vertical lines. Once World War I had ended, Mondrian returned to Paris where he would become fully immersed in abstraction painting. This is when he began producing the majority of his work as the grid-like style, filled with primary colors and bold horizontal and vertical lines. The use of asymmetry, different sizes and colors of shapes creates the flow of the piece that speaks to the rhythm of modern life according to Mondrian. To create a sense of depth in these seemingly plain paintings, Mondrian would use different brush stroke techniques to make certain colors appear to be closer or farther away. This abstract style set him apart from other artists of his time and gave him renowned recognition. During the time of this painting, Mondrian had moved from London to New York City where he would spend the rest of his living days. The inspiration behind this painting comes from the exuberance and energy of New York City, while also portraying the tempo of jazz music of that time period. This painting is much different than his previous pieces because of the use of lines of color intermixed with blocks of solid color. The yellow lines and asymmetric distribution of red and blue blocks represent taxi cabs picking up people from stop light to stop light in the busy city of Manhattan and New York City. 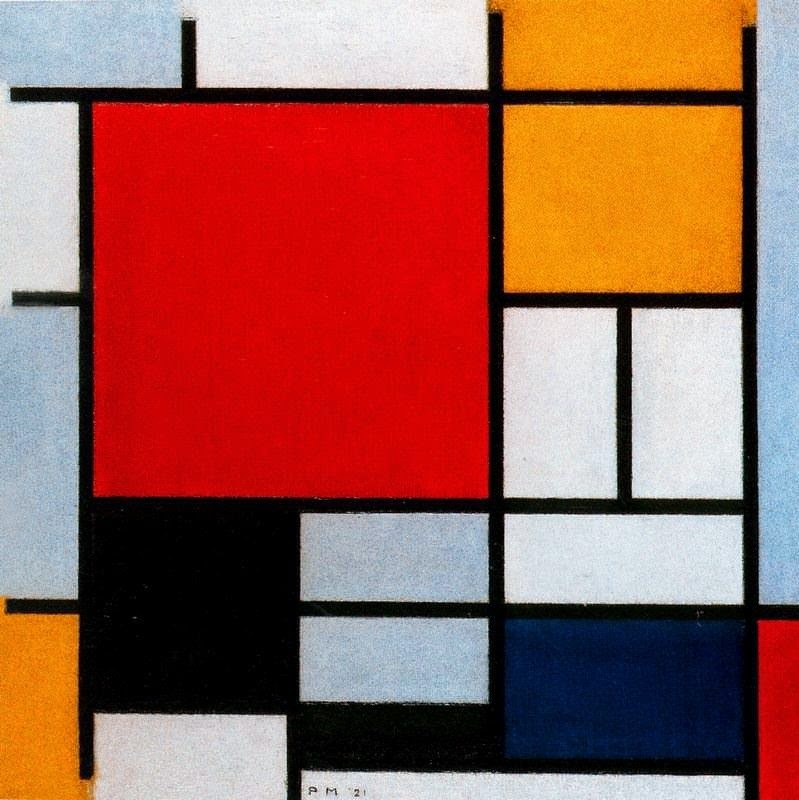 This was Piet Mondrian’s final completed painting as a symbol of his developing style of abstraction and simplicity. Piet Mondrian set the path for abstract art and became the trendsetter of the De Stijl art movement. He showed that abstraction and simplicity could be just as sophisticated and detailed as natural and realistic paintings. He also showed that use of primary colors, straight lines and corners, and geometry in a painting could create a narrative that speaks to the culture of his time. His work is now on display in Manhattan and several other museums in the Netherlands. Deicher, Susanne (1995). 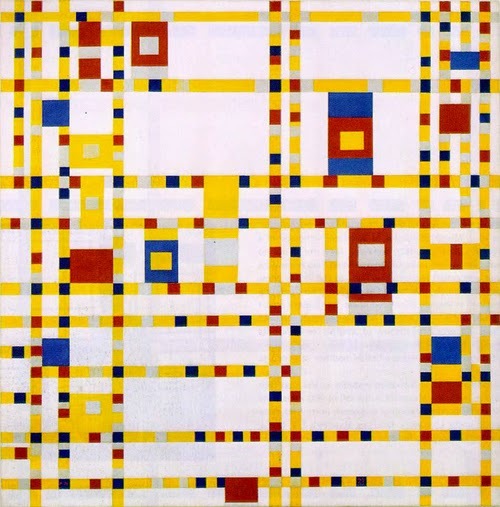 Piet Mondrian, 1872–1944: Structures in Space. Cologne: Benedikt Taschen. Piet Mondrian. (2015). The Biography.com website. Retrieved, Feb 27, 2015, from http://www.biography.com/people/piet-mondrian-9411728. Threlfall, T. (1988). Piet Mondrian: His life's work and evolution, 1872 to 1944. New York: Garland Pub. Print. 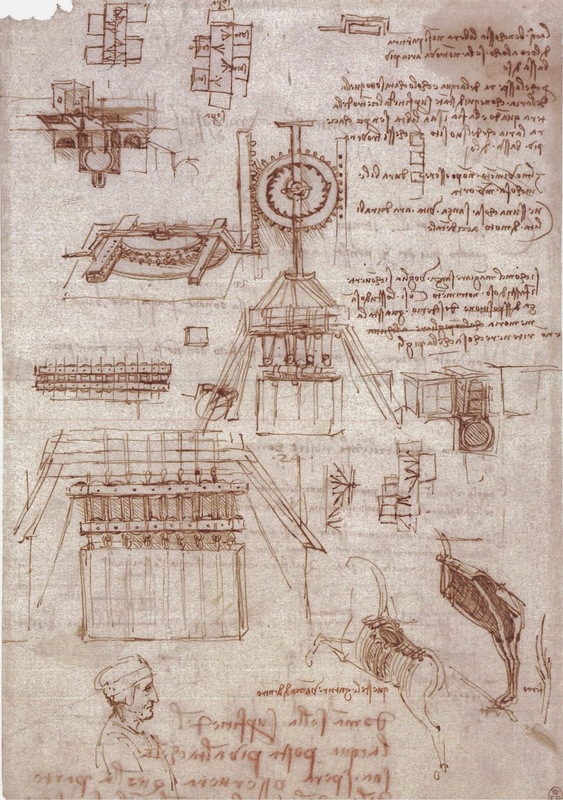 Leonardo Da Vinci was known not only as one of the greatest painters of all time, but also as a person of diverse talents who excelled in a wide variety of fields ranging from music to engineering, invention, writing, and more. Born on April 15th, 1452 in Anchiano, Tuscany (now Italy), Da Vinci got his surname from the nearby town called Vinci. Some of his best known works include paintings such as the Mona Lisa, the Vitruvian Man, and the Last Supper, which is the most reproduced religious painting of all time. In addition, he used his artistic talents to further other pursuits like anatomy and invention, producing numerous sketches of architectural designs, inventions, and painstakingly detailed anatomical drawings. Because of his curiosity and imagination, Da Vinci is typically considered the epitome of the Renaissance humanist ideal. During his time, Da Vinci was commissioned to paint on a variety of surfaces, including canvas, board, wet plaster, and stone drywall. He made his own oil paint by hand using ground pigments and also experimented with gesso and egg tempera later in his career. Da Vinci liked using muted, natural hues associated with earth, like blue, brown, and green. 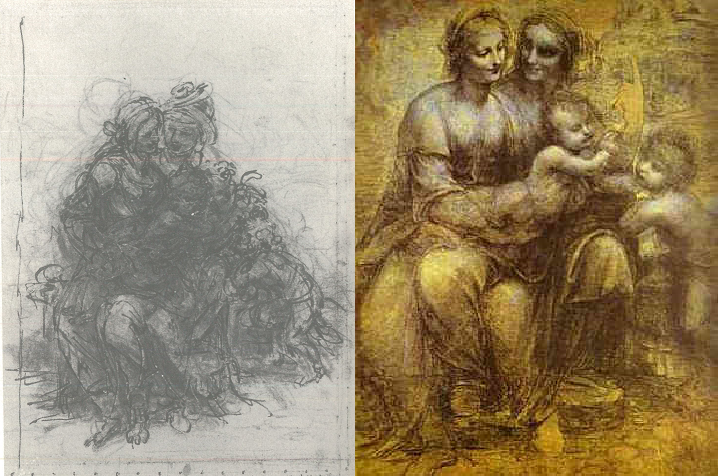 Because the colors are mild with less contrast, Da Vinci’s finished works have a very smooth, cohesive quality to them. He often started his paintings with an underpainting of gray or brown before adding layers of transparent glazes. In addition, Da Vinci was a practitioner of the technique called sfumato (like smoke), one of the four Renaissance canonical painting modes. This technique is used by combining dark glazes and blunt colors to achieve a level of depth, and an example of this can be seen in the Mona Lisa. Known around the world for her enigmatic smile, the Mona Lisa was thought to be the portrait of a real woman called Lisa del Giocondo. As mentioned earlier, the colors appear more subdued and natural. Mona Lisa’s face especially shows the use of sfumato, which Da Vinci himself described as "without lines or borders, in the manner of smoke or beyond the focus plane." 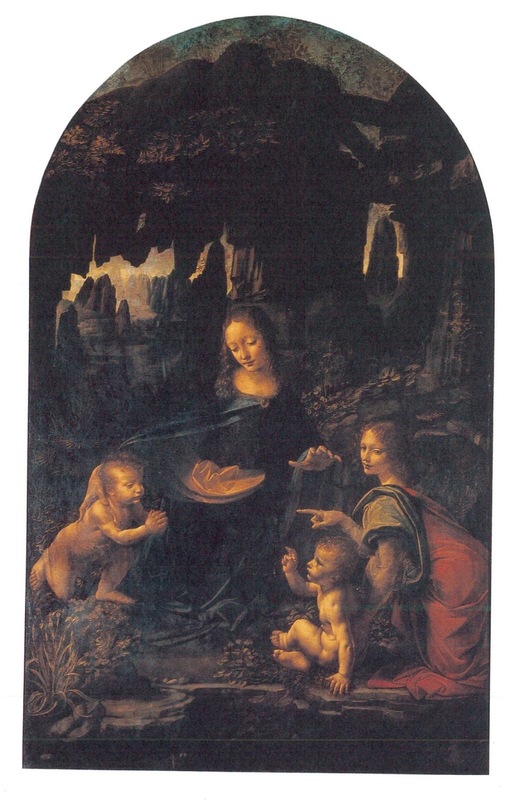 Also called “Madonna of the Rocks”, this painting is one of the two versions painted by Da Vinci that are mostly similar in composition. The four figures are Madonna, an angel, Child Jesus, and the infant John the Baptist. The range of colors used is again relatively small, and the outlines of the figures are somewhat blurred through sfumato. I like how the book presented parts of the painting (e.g. infants) with greater detail, which gave me a chance to observe the painting “up close”, as if I was actually in the Louvre (where this is currently on display). Also called the Burlington House Cartoon, the figures above show the completed cartoon (right) and its study drawing (left). I picked this one in particular because our class has put a lot of emphasis on using study drawings as a tool and these figures serve as great examples. 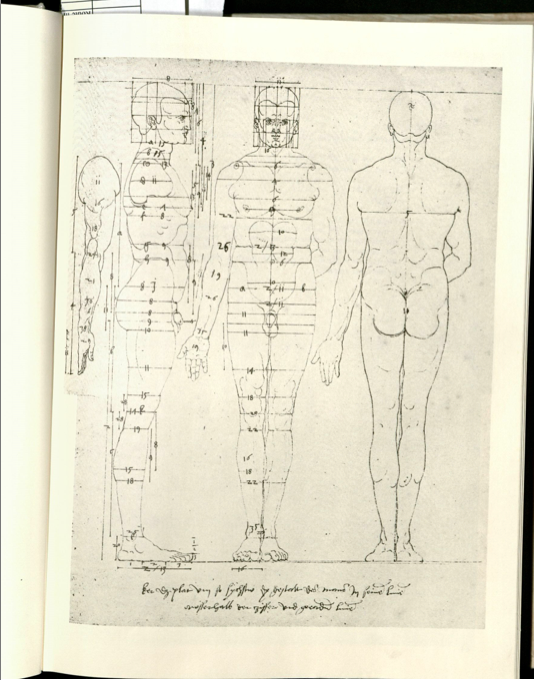 The study drawing is very rough, with loose lines indicating the four figures and their relative positions. Using it as a guide, the nearly life-sized cartoon on the right would probably have been a lot easier to develop. The last two figures shown above came from Da Vinci’s work in anatomy and creating inventions. 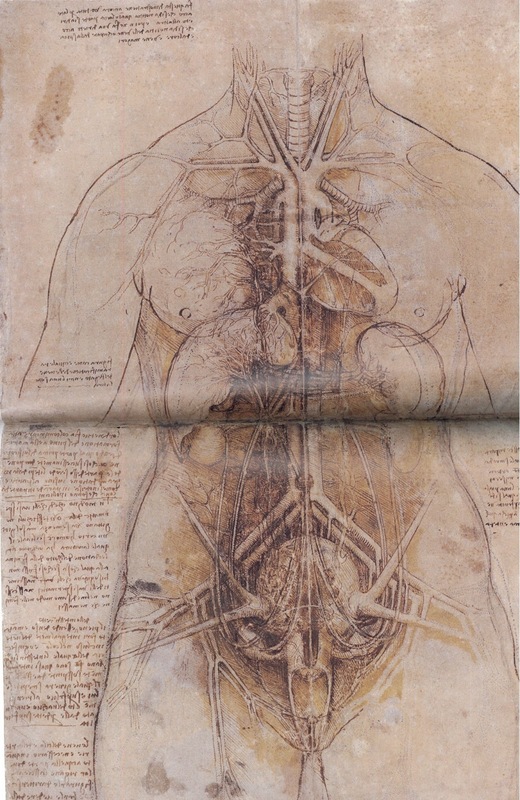 Through animal and human dissections, Da Vinci studied anatomy extensively and made groundbreaking discoveries on many different parts of the body, including the liver, spine, and aortic valve. 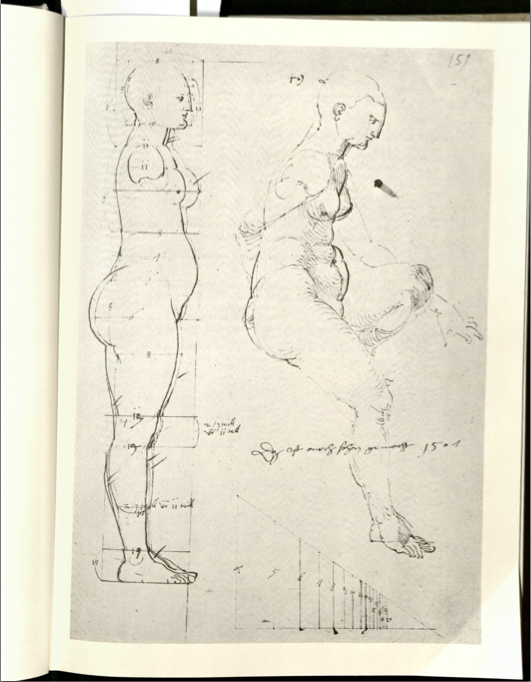 The amount of effort Da Vinci put into these studies is evident in the level of details present in his drawings, such as the example shown here (top). On the other hand, the figure on the bottom is focused on engineering and mechanical design, with an intricate setup of gears and pulleys from multiple perspectives. I chose Da Vinci because, like him, I also love learning new things from many different areas, and I think it’s amazing that he was able to accomplish so much in such diverse fields. Through his genius, Leonardo Da Vinci has made a lasting impression on the world. Even centuries after his time, we still regard him with respect and awe for his ability to imagine and create. Atalay, Bu. 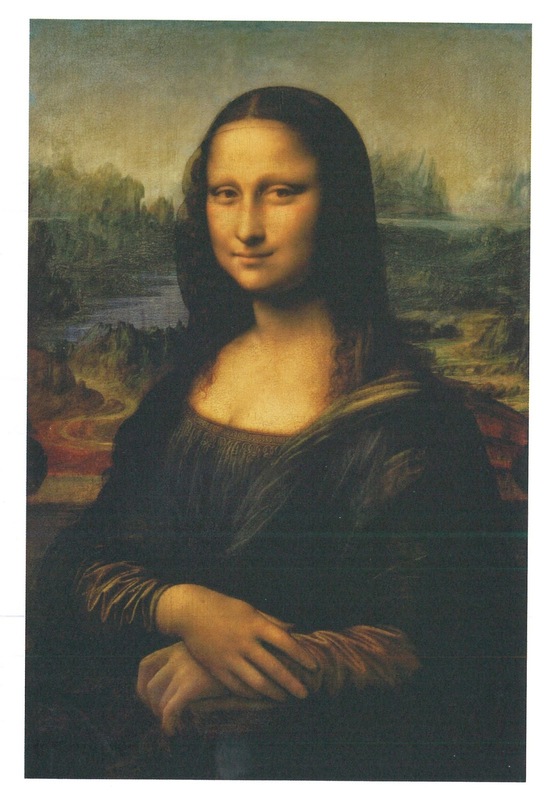 Math and the Mona Lisa: The Art and Science of Leonardo Da Vinci. Washington, D.C.: Smithsonian, 2004. Print. Aquino, Lucia. Leonardo Da Vinci. New York: Rizzoli, 2005. Print. Collins, Bradley I. Leonardo, Psychoanalysis & Art History: A Critical Study of Psychobiographical Approaches to Leonardo Da Vinci. Evanston, Ill.: Northwestern UP, 1997. Print. Kemp, Martin. Leonardo Da Vinci: Experience, Experiment and Design. Princeton: Princeton UP, 2006. Print. Kemp, Martin. Leonardo Da Vinci the Marvellous Works of Nature and Man. Rev. ed. Oxford: Oxford UP, 2006. Print. "Leonardo Da Vinci's Life." Da Vinci Painting Technique: How to Paint Like Leonardo Da Vinci. Web. 11 Feb. 2015. <http://www.davincilife.com/article4-davinci-painting-technique.html>. "Leonardo Da Vinci." History.com. A&E Television Networks. Web. 11 Feb. 2015. <http://www.history.com/topics/leonardo-da-vinci>. "Leonardo Da Vinci." Wikipedia. Wikimedia Foundation. Web. 11 Feb. 2015. <http://en.wikipedia.org/wiki/Leonardo_da_Vinci>. "Sfumato." Wikipedia. Wikimedia Foundation. Web. 22 Feb. 2015. <http://en.wikipedia.org/wiki/Sfumato>. The Italian Renaissance from the 13th to 17th Centuries is characterized by a flourishing abundance of artists, scientists, and thinkers. The larger-than-life figures of Michelangelo, Raphael, da Vinci, and others dominate the cultural and artistic history of the time. Among these historical giants, however, are hundreds of other talented artists, less remembered by history but no less passionate and creative. Jusepe de Ribera was one of these artists. Ribera was an incredibly popular and well-known artist in Italy in the 17th century, possibly the most influential and successful artist of the Spanish Baroque era. In the latter part of his career, he received international commissions and maintained a large studio. More important than his personal success, however, is the role that he played in developing the potential for cultural criticism in art. Jusepe de Ribera was born in Valencia Spain in 1591 where it is believed that he studied as a child under a local artist. In his early teenage years, he moved to Italy, eventually settling in Naples. Here in Naples, Ribera was exposed to the Classics of the Italian Renaissance. He was especially influenced by the work of Caravaggio, and much of the chiaroscuro style employed by Caravaggio can be seen in Ribera’s work. Also in Naples, Ribera marries the daughter of a Flemish art dealer and comes into contact with the works of the artists in the Flemish Baroque movement. With this unique set of influences, Ribera developed a more versatile style than any of the other artists in the Spanish Baroque movement. Ribera alternated between the dark, hard style of chiaroscuro and the looser, brighter brush strokes of the Flemish artists depending on what best suited the subject matter. He is most known for his darker material, however, often depicting aging and deformed bodies. 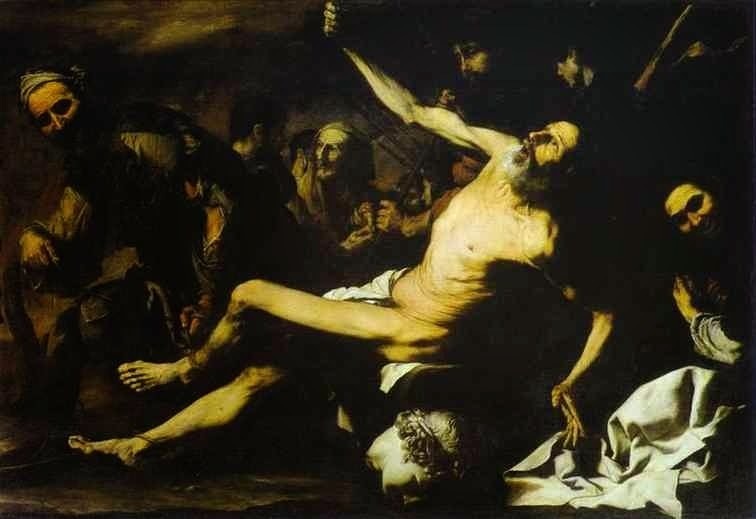 Many of Ribera’s works dealt with religious subject matter common to the era. This is illustrated in the painting The Martyrdom of St. Bartholomew. This work shows the chiaroscuro technique commonly used by Ribera, the areas of color bright in contrast to deep shadows. The painting combines the religious material required from commissions of the age with the aged bodies on which Ribera often focused. Though this work is quite different than the rest of the Spanish Baroque artists, it is not an uncommon style for Italy at that time. Ribera was also set apart from other members of the Spanish Baroque because of his propensity for sketching. Drawing was not common among the Spaniards at the time. They preferred to paint. The Italian and Flemish artists were much more likely to devote effort to drawings and etchings. Ribera took part in this tradition, doing extensive sketching, etching, and printmaking. He even used sketches and etchings to mass produce and distribute his work. Ribera is known for his portraiture of features generally considered to be unappealing. There is some debate, however, as to the purpose of this style of drawing. Some of the drawings seem to be caricatures. Others have more serious and meaningful elements, however. In Grotesque Head of a Bearded Man, with Eyes and Fur of a Dog or Monkey, one can see Ribera’s characteristic drawing style in the face of the man. This face is similar to all of Ribera’s other portraits containing subjects with medical deformities. This portrait however is complete with an ornate frame. This gives the subject of this drawing, likely a court jester, a dignity and importance that he did not have in life. Without writing directly from Ribera, the original meaning of the frame cannot be known. It has been postulated, however, that this portrait and a few others completed by Ribera are satirical portraits. These images consist of busts in the style discussed above with some added feature to move them away from reality. These features include the frame above and, often, tiny climbing figures. These features that move the subjects of the drawings into a space slightly different from reality clearly add some level of meaning to the portraits. These were some of the first satirical portraits and paved the way for further social commentary through art. Vivian Farina. “Ribera: Satirical Portrait of a Nun.” Master Drawings. Vol. 52, No. 4. Winter 2014: 471-480. Print. Artble. 2015. Web. Accessed Feb. 23, 2015. Getty. The J. Paul Getty Museum. 2015. Web. Accessed Feb. 23, 2015.